TWO OF Carlton's brightest young stars could trade places at times this season with the Blues planning to occasionally use midfielder Patrick Cripps as a marking target in attack and forward Charlie Curnow as a big-bodied clearance winner. Cripps, 22, has established himself as one of the competition's elite inside midfielders over the past three seasons. In 2016, he led the competition in average clearances (8.8 a game) and centre clearances (3.5, equal with Patrick Dangerfield), while in his injury-plagued 2017 season he still ranked sixth in clearances (6.7) and equal eighth in centre clearances (2.9). Cripps' high standing at Ikon Park was underlined recently when he was appointed joint Carlton vice-captain, along with injured defender Sam Docherty. Carlton coach Brendon Bolton told AFL.com.au Cripps still has significant scope for improvement, particularly in attack where, at 195cm and 93kg, he has the build to provide a strong aerial target. "His stats after 50 games are incredible and there were some comparisons to (Joel) Selwood's hardness, so we know we've got a player there that inspires others and really plays for our footy club," Bolton said. "That's first and foremost and, as a result, he's ready to be vice-captain at a very young age. "I think his next level will be being able to mark the ball and hurt (the opposition) on the scoreboard moving forward. That won't be just a quick fix, that will be a gradual improvement but I think that will be his next evolution. "When you stand next to him, you realise how big he is for a midfielder – he's key-position size. So if he can keep learning that craft up forward working with David Teague that just adds another part to his game." Curnow, 20, enjoyed an outstanding second season with the Blues last year. He finished fourth in the NAB AFL Rising Star award and 10th in Carlton's best and fairest count, while his strong marking and raw athleticism reminded some of Blues great Anthony Koutoufides. Koutoufides played all over the ground in his 278-game career from 1992-2007, but was most damaging in his latter years when he provided the prototype for the tall, big-bodied midfielder that is commonplace today. Bolton said the Blues would use Curnow, 194cm and 91kg, at stoppages occasionally in 2018, but remained focused on developing him as a forward at this stage of his career. "Fundamentally we see him as a forward because he's a hard match-up," Bolton said. "He's still got a lot of growth in terms of learning the craft of forward-line play and he's working hard on that – we love his attitude. "We want to make sure he's really strong in that space before throwing him around too much, but with his running capacity we see him being able to pinch-hit on the ball. So we'll do that this year, we'll give him some spurts on ball. "But we don't want to do that too much, or it could become detrimental to him learning his forward craft. He is still very young." 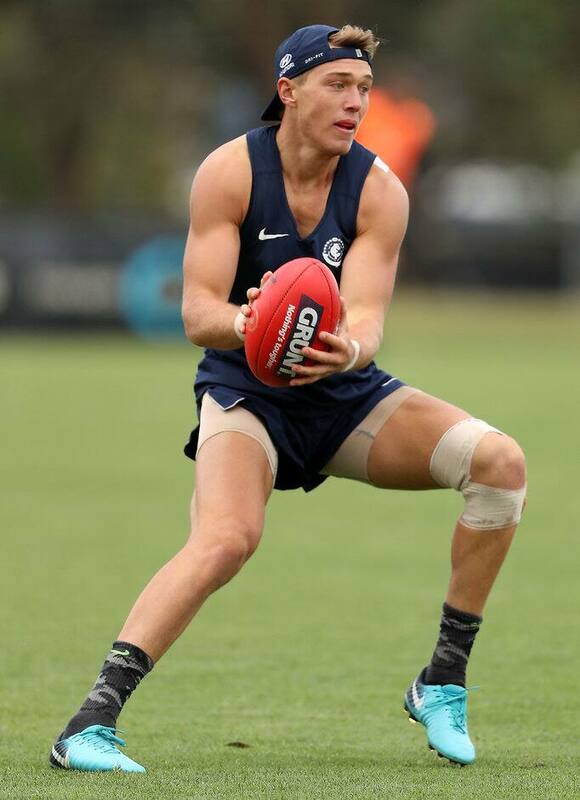 Carlton is also concentrating on developing Harry McKay, 20, as a forward. The 20-year-old tall has played just two senior games in two injury-plagued seasons at Ikon Park, but Bolton said Carlton had no plans to trial him in other parts of the ground. "He hasn't had a lot of footy in the last few years so we just need to solidify and learn that forward-line craft with him," the Blues coach said. "He's playing in some of the most difficult positions – full-forward and centre-half forward – which take a little bit of time. "But he's confident, he's a lot fitter, faster and stronger than he's ever been before, and what I like is his appetite to have a go at an aerial ball. "The glimpses he gave last year give us some excitement."